Basecamp Classic: How does the calendar work? 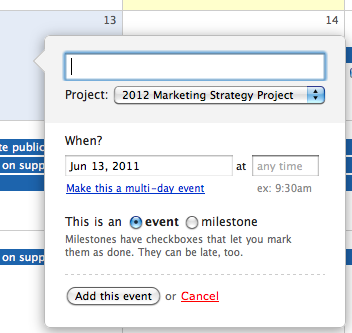 With the Basecamp calendar, you’ll see milestones and events laid out in a typical calendar view. In the Global Dashboard, you’ll see all the milestones and events from all projects while the calendar tab in a specific project will show those for that individual project. To add an entry, click either the “Create New Event” button or just click on the correct date in the calendar. When you add something to the calendar you’ll see two options: You can make the item an event or you can make it a milestone. A milestone has a checkbox and is marked late if the date passes without the checkbox being checked off. Same as before. Events don’t have checkboxes and aren’t marked late. An event might be “9am Team breakfast” while a milestone might be “Client review and signoff” or “Launch”. You can use events or milestones any way you’d like, of course. 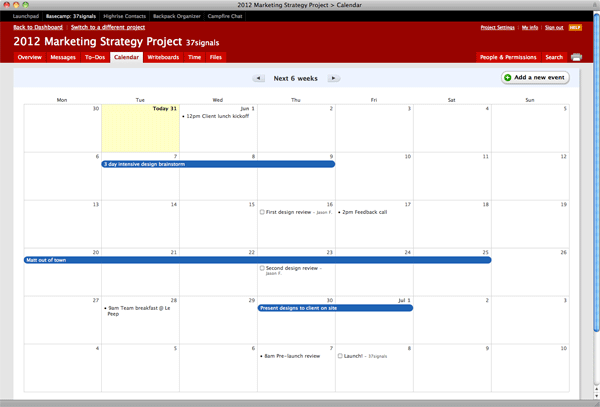 You can also add events or milestones to any project on the calendar on the Dashboard. When you add an event or milestone from the global Dashboard calendar, you’ll see a pulldown that lets you select the appropriate project. 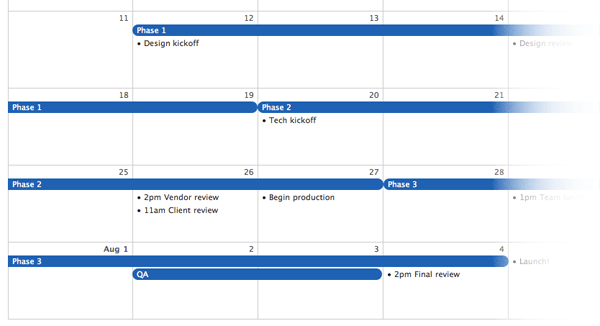 You don’t have to go into a project to add an item to that project’s calendar.